OBJECTION: In your arguments you have mostly quoted purana-vakya (quotes from Puranic texts) to substantiate your points. However, this is unacceptable. The Vedas are eternal as they emanate from the Lord Himself (apaurusaya), whereas the Puranas and smrti-sastras, although they give knowledge about God, are authored by men. They are auxiliary to the Vedas and hence their statements should be considered as secondary when compared to the statements made in the Vedas. Therefore, in order to validate your claims, you must give quotes from sruti only. Each division has 4 minor divisions, namely the Samhitas, Brahmanas, Aranyakas and Upanisads. Thus altogether the 4 Vedas contain 1,130 Samhitas, 1,130 Brahmanas, 1,130 Aranyakas, and 1,130 Upanisads. This makes a total of 4,520 divisions. At present, most of these texts have disappeared due to the influence of time. We can only find 11 Samhitas, 18 Brahmanas, 7 Aranyakas and 220 Upanisads which constitutes a mere 6% of the entire Vedic canon! Even if the Vedas were complete in there entirety, in order to understand them one must first study the Vedangas which includes Siksa (the science of phonetics), Vyakarana (grammatical rules), Kalpa (ritualistic rules), Nirukta (obscure word meanings), Chanda (Metres for chanting Vedic hymns), and Jyotisa (astrology and astronomy).
" One must complement one’s study of the Vedas with the Itihasas and the Puranas." " O best of the brahmanas, the meaning of the Puranas is unchanging just like that of the Vedas. The Vedas are all sheltered within the Puranas without a doubt. The Veda has a fear that unqualified people will read her and then distort her meaning. Thus, the significance of the Veda was fixed in the Puranas and Itihasas. That which is not found in the Vedas is found in the Smrti. That which is not found in the Smrti is to be found in the Puranas. Those who know even the Vedas and Upanisads are not learned if they do not know the Puranas." The reason they are called ‘Puranas’ is because they make the Vedas complete (puranat puranam iti canyatra). This is not to suggest that the Vedas are incomplete. It simply means that the Puranas are explanatory supplements which aid one to understand the concise and ambiguous passages in the Vedas. If the Puranas complete the Vedas, it is only logical that they must be Vedic in nature. From these above sruti statements it is clear that the puranas are part of the Vedas and originate from the same source as the Vedas, namely the Supreme Lord Himself. One may argue that since the Puranas have names such as Skanda, Agni, Markandeya etc. they must have been composed by those personalities, therefore they are not eternal and thus cannot be apauruseya. However, if that is the case, then certain sections of the Vedas must also be considered to be pauruseya-vakya since they have names like Katha Upanisad, Aitareya Upanisad (Katha and Aitareya being names of sages). It is understood that certain parts of the Vedas are named after certain rsis, not because they composed them, but because they were the main exponents of those portions. Since persons with the names Katha and Aitareya appear in every millenium, one should not misunderstand that before the appearance of those persons described in the Vedas, these names were simply meaningless words. "Therefore, O lord, with prayers I approach your two lotus feet, which are adored by the preceptors of the three worlds, because I wish to receive from you mantras of the Yajur Veda that are unknown to anyone else." In other words, the Puranas are supposed to explain the meaning of the Vedas and are only different by the changes in words, chanda (metre), rsi, sequence etc. at the beginning of each creation. In this way they are considered to be non-eternal, but their meaning will be the same as in the previous creation. Therefore Madhva categorizes the Puranas as ‘nitya-anitya’ because they originally emanate from the Supreme Lord, but they are sometimes unmanifest. As a side note, it may be asked that if the Puranas are indeed subsidiary to the sruti-sastras, why does Sri Madhvacarya himself quote them so often in his works? Not only that, he even uses puranic evidence in order to establish the nityatva of the Vedas! If the Puranas are not eternal and apauruseya, why would he use their ‘secondary statements’ as a pramana to validify something which is superior? Another point is that in the chanting of the Brahma-yajna (formal study of the Vedas), the Puranas are included. If they were not Vedic in nature they would not be included. Therefore the Taittiriya Aranyaka (2.9) states yad brahmananitihasa-puranani: "The Itihasas and Puranas are Vedas." "That almighty Lord (Sri Vyasa) chose me as the qualified speaker of the Itihasas and the Puranas. In the beginning there was only one Veda – the Yajur Veda. This was divided into four portions. From these stemmed the four performances known as the catur-homa by which he (Vyasa) arranged for the performance of sacrifice. The Adhvaryu priest uses the Yajur mantras, the Hotra priest uses the Rg mantras, the Udgata priest uses the Sama mantras, and the Brahma priest uses the Atharva mantras. The statement of Sri Suta Gosvami in the above verse from Vayu Purana in which he says that ‘Whatever remained after Vyasa had divided the Vedas into four divisions was considered to also be the Yajur Veda’ indicates that the essence of the original Purana (which was the remaining part of the Yajur Veda) became the condensed version of the Purana consisting of four-hundred-thousand slokas, available on the earth-planet. "O best of the brahmanas, understanding that the Purana would gradually become forgotten, in every yuga I appear in the form of Vyasa and condense it." "The Purana contains four-hundred-thousand verses which is divided into eighteen parts. These are passed on via oral tradition every Dvapara-yuga on the earth-planet. Even today the original Purana which consists of one-billion verses exists in the heavenly planets. The essential meaning of that Purana is contained in the smaller version of four-hundred-thousand verses." "That Lord who is most intelligent then divided the Vedas into four. He therefore became known as Veda Vyasa. He also summarized the Puranas into four-hundred-thousand verses which are still available in the heavenly domain in the form if one billion verses." However, it should be explained that although the Puranas and Itihasas are known as the fifth Veda — that does not mean that they are literally identical in all ways with the Vedas. If that were so, Purana and Itihasa would just be names of certain sections of the Vedas. The difference between them is in annotation and the order of words. The Vedas are chanted in a particular style involving three tone accents (svaras) called udatta, anudatta and svarita. If a word is chanted in the wrong accent, the whole meaning of the sentence can change. As regards the order of words, the Vedas maintain a particular sequence which has not changed since the dawn of creation. There is no scope for even the slightest change in the Vedic texts, whereas the texts of the Puranas change according to kalpa-bheda. It is for this reason that we find occasional differencies in certain editions of the Puranas. Another distinction between the Vedas and the Puranas is that although the Puranas are considered part of the Brahma-yajna, they are not used in the performance of Vedic sacrifices. Unfortunately, major problems also arise when trying to studsy the Puranas. Firstly, although the Puranas are much more accessible than the Vedas and more readily available, they too are not available in their entirety. The eighteen Puranas and eighteen Upa-Puranas are a vast body of literature and there are so many different versions that it is difficult to know which editions are complete and which texts have been interpolated. This is due to the fact that there are no current disciplic schools nor bona-fide commentaries for most of these works.
" O beautiful lady, one should know that the Visnu, Naradiya, Bhagavata, Garuda, Padma and Varaha are all in the mode of goodness. The Brahmanda, Brahma-vaivarta, Markandeya, Bhavisya, Vamana and Brahma are in the mode of passion. The Matsya, Kurma, Linga, Siva, Skanda and Agni are in the mode of ignorance." Sri Krsna has clearly expressed in Bhagavad-gita that goodness is superior to passion and ignorance. 8 Similarly, Sri Suta Gosvami explains in the Bhagavata(1.2.24) that "Passion is better than ignorance because it can lead to realization of the Absolute Truth. "9 In this verse Suta speaks about which type of worship produces the ultimate benefit, and his conclusion is that one can only achieve the best result by worshipping Lord Visnu. The sattvika Puranas recommend the worship of Visnu / Krsna, whereas the rajasika and tamasika Puranas advocate the worship of minor deities and therefore do not lead the aspirant towards the Absolute Truth. It is noteworthy that the sattvika Puranas commence with a questioner inquiring from a learned speaker about the nature of the Absolute. The speaker’s answers are clear, direct and unambiguous, leaving no room for misinterpretation. However, in the tamasika and rajasika Puranas questions are put to the speaker which do not pertain to the Absolute Truth. For example, in the Linga Purana the sages request Suta to speak about the glories of the Lingam form of Lord Siva. We may conclude from this that although Sri Suta Gosvami is learned in transcendental subject matters and expert in explaining them, the questions by the sages here restrict him from speaking on it. All rajasika and tamasika Puranas contain this characteristic defect and therefore are not reliable sources of transcendental knowledge. "In the Vedas, the Ramayana, Puranas and Mahabharata, from the very beginning to the end, as well as within the middle, only Hari, the Supreme Personality of Godhead, is explained." Yet it must be understood that although rajasika and tamasika Puranas do not speak extensively on the Absolute Truth, this does not mean that they give no valid knowledge at all. If this was the case why would acaryas such as Madhva cite from Puranas such as Skanda, Brahma, Brahmanda, Brahma-vaivarta etc which are not sattvika by nature? The Puranas in the lower modes may also give some insight into the Absolute Truth, although not to the same extent as the sattvika Puranas. By this we may conclude that the sattvika Puranas are the ultimate pramana. This is also declared by the Padma Purana - sattvika moksa-dah proktah: "The sattvika Puranas give salvation." Unfortunatly, as stated before, there are no current disciplic schools nor bona-fide commentaries for most of these works. Some of the sattvika Puranas recommend the path of bhakti, while others glorify the path of jnana or yoga. "You have not actually broadcast the sublime and spotless glories of the Personality of Godhead. That philosophy which does not satisfy the transcendental senses of the Lord is considered worthless." "That purana is known as the Bhagavata which gives the highest religious principles, refers to the sacred gayatri mantra, and tells the story of the slaying of Vrtasura. This purana has 18,000 verses and whoever writes down the entire text and places it on a golden throne and gives it in charity to a qualified person on the day of the full-moon of the month of Bhadra will attain the Supreme abode." Most importantly, the Bhagavata is the crowning glory of the divine author’s literary efforts, soothing his heart when he felt that his work remained incomplete. "The Bhagavata and the Supreme Lord are always of the same nature – possessed of eternal existence, knowledge and bliss." "If the Bhagavata is not kept in one's house in the Kali Yuga, of what avail are collections of other scriptures by the hundreds and thousands? How can he be condidered a Vaisnava who, in the Kali Yuga, does not keep the Bhagavata in his house? Even if he is a brahmana, he is lower than an outcaste. O Narada, O Sage, wherever the Bhagavata is found in the Kali-yuga, there Hari goes together with all the demigods. O Muni, that pius soul who daily recites a verse from the Bhagavata reaps the fruits of the eighteen Puranas." 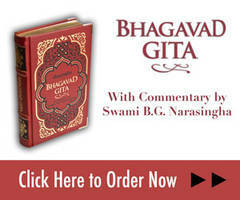 "Of all the puranas, the Bhagavata is the greatest. In every line the sages glorify Sri Krsna in various ways." "The first and second cantos of the Bhagavata are Sri Krsna’s feet. The third and fourth cantos are His thighs. The fifth canto is His navel. The sixth canto is His chest. The seventh and eighth cantos are His arms. The ninth canto is His throat. The tenth canto is His beautiful lotus-face. The eleventh canto is His forehead. The twelth canto is His head. I bow down to that Lord , the ocean of mercy whose color is like that of a tamala tree and who appears in this world for the welfare of all. I worship Him as the bridge for crossing the unfathomable ocean of material existence. The Bhagavata has appeared as His very Self." "Due to his compassion, the sage (Vyasa) thought it wise to do something which would aid those who were ignorant of how to achieve the ultimate goal of life. Therefore he compiled the Mahabharata for the benefit of women, sudras and brahmana-bandhus (so-called brahmanas) who were not eligible to study the Sruti." This is evidence that the Vedas are the sole property of the brahmana class. REFUTATION: We should understand from the above statement (stri sudra brahma-bandhunam) that the Mahabharata is indeed meant for those classes, since they are generally considered less-intelligent as regards their philosophical perception. Therefore Vyasadeva provided such people with the Mahabharata — a philosophical text presented in a palatable story-form. We have no argument that one must be a brahmana to study the Vedas – in fact only a brahmana can study the Vedas! Who else is qualified, or indeed, interested? Our question is, who is a brahmana and what are his qualifications? Again, this query has been answered by us already in a previous text. "The Bhagavata is as brilliant as the sun. After Sri Krsna has left for His abode, accompanied by dharma and knowledge, it has arisen to save us from the darkness of the age of Kali." 1- This is affirmed by Lord Krsna in the Bhagavata (11.3.44) – "paroksa-vada vedo’yam" (The Vedas speak indirectly). 2- In the case of the Bhagavata, this itself is a contradiction from the point of view of the Madhva sampradaya. If the Vedas are considered a primary authority merely because they issued from the mouth of God Himself, the Bhagavata and Mahabharata should also fall into such a category since the author of these works was Veda Vyasa, whom the Tattvavadis consider to be a direct avatara of Narayana. 3- This verse from Chandogya Upanisad is also quoted by Madhvacarya in Visnu Tattva Vinirnaya (5). It is also worth noting that in Prof. K.T. Pandurangi’s work The Principal Upanisads (Dvaita Vedanta Studies and Research Foundation, Bangalore 1999) wherein he explains Madhvacarya’s Upanisad commentaries, the author gives the same meaning of this verse. "The Vedas were divided into four, namely Rg, Yajur, Sama and Atharva. The Itihasas and the Puranas are said to be the fifth Veda." "An Akhyana is a description of that which is witnessed by the speaker. An Upakhyana is a description of something the speaker has not seen, but merely heard about. A Gatha is a song dedicated to the forefathers and beings present upon the earth." 6- The word sankspitam in this verse is important. This means ‘condensed’ and not ‘composed’. In other words Sri Vyasa condensed the already existing Vedas, then taking unused verses from that condensed portion, he compiled the Puranas. Thus, the Puranas must be understood to be equal to the Vedas. "The five subjects which make up a Purana are creation (sarga), secondary creation (pratisarga), geneology of kings (vamsa), the description of the Manus (manvantara) and the activities of those kings (vamsanucarita). " 8- In this verse the word ‘agni’ (fire) refers to the Vedic sacrifices wherein one offers oblations into various sacred fires. ‘Kalpesu’ means ‘scripture (in this case Purana) according to the definition given in the Medini Sanskrit dictionary 1.21.2 (kalpa sastre vidhau nyaye samvarte brahmane dine – the word kalpa means ‘scripture’, ‘rule’, ‘logic’, and ‘day of Brahma’.) The word ‘ca’ in the phrase ‘sivasya ca’ implies the consort of Lord Siva, namely Goddess Uma. ‘Sankirnesu’means ‘in the various Puranas which are in mixed modes of goodness, passion and ignorance. The word ‘sarasvatyah’ refers to the presiding deity of speech and, by implication, the various devas referred to in various scriptures which she embodies. ’Pitrnam’ refers to the karma-khanda rituals meant for attaining the heavenly planets of the manes (karmana pitr-lokah). 11- Quoted by Sri Madhva in his Bhagavata-tatparya.